The Kansas City Royals have found their DH and fill-in first baseman for Eric Hosmer. They only needed to look to the other side of the state. 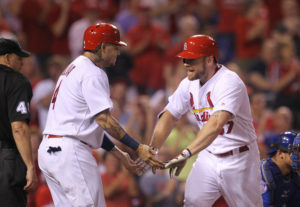 Former Cardinals slugger Brandon Moss is staying in the state of Missouri. He’s reached a two-year deal with the Royals worth $12-million, pending a physical. The 33-year-old Moss hit 28 home runs in 413 at-bats with St. Louis last year, but hit just .225.